The new book traces 35 years in the lives of two early 19thC women, readers first meet them as young girls. 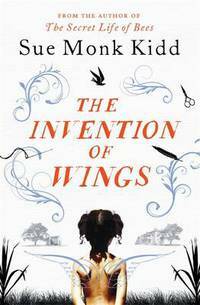 Sarah Grimké is based on real-life Sarah Moore Grimké, a South Carolina abolitionist, suffragist and writer who leads a privileged, wealthy life but is rebellious and kind. On her 11th birthday, her biggest wish is to become the country’s first woman lawyerand as a gift, she’s given ownership of her own maid, Hetty “Handful” Grimké, 10. Handful is a slave along with her mother at the family’s Charleston home. Sarah refuses ‘the gift’ then writes a note attempting to give Handful her freedom. She’s overridden by her parents and so begins a long relationship between the two women both fighting for their own types of freedom.The story is told in the alternating first-person voices of Sarah and Handful, which the author makes distinctive. This entry was posted in Book Reviews, Books and tagged American Fiction, Book Reviews, Sue Monk Kidd. Bookmark the permalink. ← Books that Shaped Work in America.